The Exclusivity of Myanmar Brings With It A Peaceful Diving Experience. There are hundreds of islands scattered around Myanmar’s long coastline and it is located right next door to Thailand. However, until the recent political changes, Myanmar has been largely closed off to the rest of the world. In the early years, divers loved discovering different dive sites within the 800 islands that form the Mergui Archipelago. Slowly over time certain dive sites have become more popular, yet divers can still find a serenity in Myanmar unlike any other. The marine life and variations in species is incredible, and only a few liveaboards are actually travelling around out there. The breathtaking scenery is completely unspoiled by the mass of tourism. The Lime Stone Coasts of Myanmar Are Home to An Abundance of Marine Life. Almost 95% of the dive sites in Myanmar are all formed by a lime stone coastline. It is home to many small critters, as the soft and hard corals find it easier to attach to lime stone. In Through The Out Door is one of the most exquisite sites, and can be most likened to an incredible aquarium. The marine life there is so diverse and the topography of the dive site is incredible. It’s always a place where you will never expect what will happen next. As the name suggests, it depends which way you dive the dive site as to which way you can go. In strong currents, it is impossible to go through both ways, so the names perfectly describes the dive site. Myanmar’s Marine Diversity is an Endless Divers Paradise. There are often sightings of great barracuda up in Myanmar. On night dives around these outcrops there is always the opportunity to see barracuda hunting. You can also see bowmouth guitar sharks as well as a Rhinopias, a Lacy Scorpionfish. At the Fan Forest Pinnacle, sea fans are abundant. This is due to the nutrients in the water and the strong currents during the low season, which encourages their growth. Despite the strong currents and their battered look, the sea fans grow well past normal. Frog Rock is a great dive site for soft corals, which now is the pinnacle at Western Rocky. The soft corals there go right up to the low tide mock. Black Rock Keeps Divers Exploring For Dives On End. Black Rock has suddenly the premier dive site in Myanmar for seeing the larger mega fauna. It is a really big underwater island that is located right out in the middle of the north Andaman Sea. Travelling from the Three Islets, it takes about five and a half hours to get to Black Rock. Once you are at Black Rock, it will take four to five dives to discover Black Rock and have a look around the whole of the rock. It is a very special place and over the years has been congregating manta rays, the manta birostris. It is a place where the oceanic manta rays go. The species was discovered by the researcher Andrea Marshall, who is now working to track migratory patterns of manta rays in both Myanmar and Thailand. Access Myanmar Via A Liveaboard From Thailand. Liveaboards to Myanmar don’t depart from Myanmar, they usually depart from Thailand. There are two different routes that you can take. Most of the diving starts in the south at a port called Tap Lamu, which is a popular port for Liveaboards to leave from and en route from Tap Lamu up to the immigration in Myanmar, there are three of arguably the best dive sites in Thailand; Koh Bon, Koh Tachai, and Richelieu Rock. When travelling to Burma, you can either visit these three dive sites on the way up or on the way back, which is a great way to finish the trip. It’s very rare to see anybody else when diving around in Burma, so once you see another few divers underwater on the way back, the reality hits home that you are back in the real world, no longer in the peaceful Myanmar paradise. Snorkeling, Diving Expertise, and How to Prepare for Myanmar. The snorkeling in Myanmar can be exquisite. Many travelers like putting on a set of fins, a mask, a snorkel, and jumping in the water. Whatever they see is a bonus and of course, there are many nice bays with several sheltered areas to go snorkeling. Some snorkelers have reported seeing grey reef sharks, which can be quite the experience. When it comes to diving in Myanmar, there are a few things to be particularly weary about if you are a novice diver. It is recommended that you are an advanced diver. A lot of the dive sites are deeper than the recreational limit for open water divers, and of course, the deeper you are on a pinnacle, the less current there is. So you can hide from the current a little bit more. The Spectacular Photographic Opportunities Are Endless. Apart from the underwater life — which is incredible — there is also a very, very big diversity land and bird life up in Myanmar. From eagles, to hornbills, to sea owls, and most of all the incredible marine life, the photographic opportunities are in abundance. Photographers are attracted from all over to capture magnificent action and marine life in and around the islands. The potential is endless, and there is something for all, on both land and sea. [0:00:06.2] CM: Hello and welcome to Dive Happy, the podcast about the best places to go scuba diving in Asia. I’m your host, Chris Mitchell and my guest is the experienced dive guide Clive White who has been diving in Myanmar since 1999 and is currently the cruise director for the Thailand Aggressor. [00:00:22.0] CM: Hi Clive, welcome to the show. [00:00:24.0] CW: Good morning Chris, how are you? [00:00:25.9] CM: Very good, thank you. So Clive, Myanmar is next door to Thailand but until the recent political changes, it’s been largely closed off to the rest of the world and there’s hundreds of islands scattered around Myanmar’s long coastline. So what is it for you that’s made Myanmar so special and when it used to be quite difficult to get there? What is it that keeps you going back? [00:00:49.1] CW: I think that’s changed over the years. In the early years, it was very nice to be discovering different dive sites within these 800 islands that form the Mergui Archipelago. Then slowly as we realized which dive sites were performing the best or which was the better dive sites, actually finding all the different marine life and the different critters, the variation of the species up there is incredible. I think that was one of the things that drew me to the place and of course being alone up there. There’s very few liveaboards that are actually travelling out there. [00:01:24.0] CM: Right, is that still the case now even though it’s opened up a bit more? [00:01:29.2] CW: I think now because it has opened up a little bit, it’s seen as a little bit more politically correct to go there and we have seen an increase in the amount of boats that are going up there. A lot of the boats are introducing the one week per month up there during the high season and some boats are just going up there for two, three weeks at a time and then returning to Thailand. [00:01:53.9] CM: Wow, yeah. One of the things that I remember about diving in Myanmar with you was how, not only empty, but quite desolate how it felt out in the middle of the islands. [00:02:05.3] CW: Oh yes, it can be quite breathtaking really when you turn up to these huge islands and there’s actually no inhabitants on them at all and of course, there’s breathtaking scenery up there still and completely unspoiled by the mass of tourism. [00:02:21.5] CM: That’s right because it’s all limestone around that, right? That’s why the dive sites has so many nooks and crannies? [00:02:26.7] CW: Yes, it’s probably 95% of the dive sites up there are lime stone so yeah, a lot more small critters and I think the soft and hard corals find it easier to attach to lime stone. We do have a couple of dive sites up there that are granite boulders, which is similar to what we get down in the south of Thailand but predominantly it is lime stone and pinnacles and outcrops. [00:02:51.3] CM: Yeah, one of the key dive sites has a very memorable name for any Led Zeppelin fans that in through the outdoor. Why is that particular dive site such a must see on Burma itineraries? [00:03:04.1] CW: I describe it when I give my dive briefings that if you wanted to build an aquarium with nice topography and fish life, I think it’s actually an environment in itself, the small rock there and if you were to put four glass walls around there, I think you’d have an incredible aquarium. The marine life there is so diverse and the topography of the dive site is incredible. It’s always a place where, one of these dive sites that you will never know what’s going to happen and anything can happen there. [00:03:35.9] CM: Yeah, it’s quite a dramatic swim through there right? [00:03:39.8] CW: Yeah and as the name suggests, it depends which way you dive the dive site as to which way you can go. In strong currents, it’s impossible to go through both ways so it’s a well named dive site. [00:03:53.1] CM: Is there still a large resident school of barracuda that hover around near the entry and exit point? [00:03:59.5] CW: Yeah, we do. We do see more great barracuda up there than we see in the south and of course, on night dives around these outcrops there’s always barracuda hunting. [00:04:10.1] CM: Right and when you go through that sort of, like an underwater canyon effectively, you get spat out onto a reef beyond it. That reef area is one of your favorite bits isn’t it to go noodling for critters? [00:04:23.9] CW: Yes indeed and that’s where we have the most success over the years out on the — again, on the sands, there’s a lot of sea fans and a lot of corals out in the sand there and we found so many different species that we found nowhere else in Burma. I was lucky enough a few years ago to find a Rhinopias there, a Lacy Scorpionfish. [00:04:49.7] CW: Very nice find indeed, yeah. Unfortunately, I’ve only got a couple of pictures of it. Battery was a bit low on the camera at this point. [00:04:57.4] CM: Did you find a guitarfish out there as well at some point? [00:05:00.6] CW: Yeah, occasionally we do see these bowmouth guitar sharks. I was lucky enough to see a couple this season as well, at a dive site a bit further south, Western Rocky. Yeah, they are very nice to see and also we don’t see so many of those in the south as well. [00:05:18.0] CM: Right, you mentioned about there being sea fans, there’s another site which is called Fan Forest Pinnacle for obvious reasons. 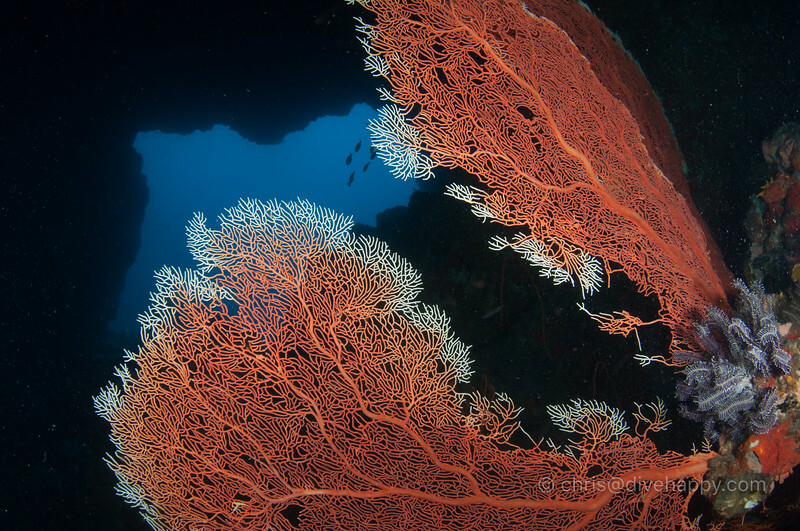 The sea fan seems to be extremely popular, they’re just everywhere in Burma. Is there a particular reason for that? [00:05:32.7] CW: I think it’s the nutrients in the water and the strong currents during the low season, I think it just encourages the growth so much. We also see the sea fans and they don’t seem to grow in this lovely heart shaped fashion. They’re always battered by the currents, there’s a bit broken off one and quite often the sea fan will grow so large on the rock that it’s on the piece of rock that will actually pull away from the substrate. [00:06:08.6] CW: Yeah, a lot of nutrients in the water up there. [00:06:08.6] CM: Yeah and despite the currents, they get to be a pretty big size don’t they? I mean as big as a diver. [00:06:18.1] CW: Yeah, I was lucky enough a couple of years ago to find one asleep on the sand and that was certainly approaching the three meter mark, so very large. [00:06:28.1] CM: Fantastic. There’s also quite a lot of soft corals if you know the right places to go. I’m thinking of Frog Rock and places like that? [00:06:35.2] CW: Yeah, Frog Rock is a great site for soft corals and my personal favorite, I think now is the pinnacle at Western Rocky. The soft corals there, they go right up to the low tide mark. The whole rock is just covered in soft corals and we’ve been lucky this year we’ve found a couple of clown frogfish around this soft coral, up very shallow about seven or eight meters deep. [00:07:00.2] CM: Fantastic. Yeah, the memorable site, I remember from the last Myanmar trip we did was I think it was pronounced Kopkum bay? [00:07:10.9] CW: Kopkum Island yeah. [00:07:16.3] CM: Kophum Islands and I can’t remember, is it a lagoon that you swim into? [00:07:15.8] CW: Yeah, it’s only accessible by boats at low tide. You can just about get a dingy underneath kind of a hole that’s been worn in the rock by the sea water and then once you get into the lagoon, the actual maximum depth in there is only about three to four meters and it’s only that depth in a very small area and it shallows out and forms these very nice lagoon. It’s actually heart shaped as well, which from the aerial photography that we’ve done there, we can get some quite nice images from there. We were recently up there in a private yacht with a quadcopter and took some very nice pictures. [00:07:57.8] CM: Fantastic, yeah with that lagoon it’s a — do you think that it’s an extinct volcano? Because you swim to it and then you pop up and like you said, it’s just all around you. [00:08:06.7] CW: No, I think really what it is, is that it was actually like a valley and over the years, the water has eroded the lime stone and then suddenly it just is flooded. Very close to Kopkum Island is another island which is facing in the same direction. It’s extremely similar to Kopkum Island but the opening in the front of it is instead of Kopkum Island which is about four or five meters wide, the opening at the front of Spur Island are about 50 or 60 meters but it is almost in this complete crescent so I think at one time that was probably closed off as well. [00:08:46.0] CM: Wow, so we just talked about In Through the Outdoor with this Three Islets and that is normally, well for a lot of liveaboards that go to Myanmar, that is the furthest north they would go into the archipelago is that right? [00:08:58.9] CW: Yeah, there’s a few liveaboards, normally the budgets and liveaboards they will go as far as Three Islets perhaps venturing a bit further north for a few trips in the height of the season but it’s quite a long way to the next dive site from there. [00:09:16.0] CM: And the next dive site would be the kind of pinnacle of Myanmar diving, which is Black Rock. [00:09:20.6] CW: Yes, Black Rock. It’s suddenly the premier dive site in Myanmar for seeing the larger mega fauna and also, we’ve had good luck with finding the smaller stuff there as well. [00:09:33.2] CM: Yeah, it’s an incredible site. It’s a really big rock. It’s not a rock, it’s really is itself too small a word to describe it because it is like an underwater island isn’t it? [00:09:43.3] CW: Yeah and we’ve spent so much time there exploring the different parts of the rock. Once you’re at Black Rock, there’s a days diving at Black Rock — and it will take four to five dives to discover Black Rock and have a look around the whole of the rock. Yeah, it’s a very, very special place and also one of the areas that we found over the years where we have congregating manta rays, the manta birostris. [00:10:13.6] CM: Right because this is where the oceanic manta rays go isn’t it? That the researcher Andrea Marshall, well she discovered it didn’t she? [00:10:22.0] CW: Yes, she discovered the species and yeah, in the past we’ve been working closely with Andrea and we’re also uploading the images of manta rays we see up in Myanmar and also Thailand as well to try and work out the migratory patterns of the animal and we’re uploading these to Manta Match Up. [00:10:46.1] CW: She’s a good site for ID shots. [00:10:49.1] CM: Yep and at Black Rock, is it only oceanic mantas that you see? I think I remember you telling me that, is that right? [00:10:56.4] CW: Yes, I very, very rarely — since studying the manta rays and realizing how to tell the difference between them, I very, very rarely see the reef manta or the manta alfredi in any of the waters in the Andaman Sea. [00:11:12.1] CW: Yeah and really, we don’t seem to see the schooling manta rays that I see in many other places. The animal behaves differently as well. I think these giant mantas are circulating on a predetermined route and really for mating purposes. [00:11:33.0] CM: Right and also, given Black Rock’s remoteness because it’s a three hour steam isn’t it from three? [00:11:39.2] CW: Yeah, it’s right out in the middle of the north Andaman Sea. It takes us from the Three Islets, it takes us about five and a half hours to get to Black Rock. So you are talking about 50 nautical miles further north and there’s no islands close to it either. I think the closest islands are about three hour motor away or so. [00:12:03.3] CM: Wow, so that sort of gives it a natural protection from fisherman and so on and so forth does it? [00:12:09.3] CW: Yeah, we do see fishing boats up there but the waters around the area are so deep that this is actually the only place that they can come and anchor and they tend to come there because you can find out around Black Rock or maybe up to about a quarter of a mile away, it’s about 50 meters deep so they can actually anchor out in the deep water. [00:12:33.2] CM: Right, yeah and it’s completely exposed around there isn’t it? There’s no way for a boat to hide. [00:12:38.8] CW: No, nowhere at all. [00:12:41.2] CM: So yes, you do want to be in a decent boat if you go out there. [00:12:46.6] CM: Okay, so given that there’s 800 islands in the archipelago, how much do you think is actually been explored by liveaboards if Black Rock is the furthest north any more tip that goes? [00:12:59.0] CW: Well, we have been up a lot further north. I’d say up as far as some islands called West Canister which is again about another 15 hours north of Black Rock. [00:13:13.6] CW: And up there it’s extremely remote and we very rarely even see the fishing boats or anything up there. So I think there’s an awful lot left up there to explore and discover. We found the few dive sites up there that set a new, if we’re up in that area again, we will be diving and I think slowly as Myanmar or Burma opens up, I think more exploration will come up in this area as well. [00:13:45.1] CM: Do you think there’s going to be with the opening up of the country, do you think there’s going to be resorts getting built on some of the islands on the archipelago and that sort of thing or is it still all up for grabs or it’s just too difficult to do it? [00:13:57.6] CW: No, I do believe that there will be resorts built on some of these island. There has been a resort on one of the islands for many, many years. I don’t really know how successful it was in previous years but I imagine that it’s probably the tourism is picking up there at the moment for sure. There are actually quite interestingly a couple of privately owned islands up there and one of the owner’s who has actually been in contact with me that is starting a turtle incubation project there and has sealed off all fishing activities that are going off in this one particular region. So yeah, it is moving along up there and working closely with the Myanmar tourism and leisure. I do believe that there will be some structure as to what is allowed to be built up there and what is beneficial to the local community weighed off as against what is best for the big organizations. So hopefully and they seem to have the right attitude at the moment so the environment is paramount in their eyes at the moment. [00:15:10.6] CM: Right, you mentioned local communities because you have done some work with different villages that are scattered through the islands in the archipelago. [00:15:17.6] CW: Yes, we’ve tried to help out in a couple of places but predominantly, we’ve been working on the islands very close to Lanbi Island which is one of the largest islands in the archipelago and there are still groups of nomadic sea gypsies moving around the archipelago. They’re subsistence fisherman and they have their own way of life, their own way that they wish to be treated and a lot of them do wish to be left alone. But also, unfortunately I think in the past have been bullied by the mainlanders and so this is part of the problem that we have up there and we tried with a few educational projects up there combined and linked in with some projects to help them and educate them regards rubbish and the disposal of garbage because this is actually having a detrimental effect on their health as well. So we have been supplying wheelie bins up there. On a recent visit there back in March time, it’s incredible what’s the transformation that’s got on, on in this island, our project was picked up on by the big charity that is working in the area. A charity called Oikos,which is an Italian based charity and after we’d supplied these bins, of course we were completely unprepared for what to do next or we’re not charity workers so actually getting people to use the bins was the next step. And fortunately, Oikos, they jumped in and there is now a full blown recycling project going on in there with school. They don’t go to school on Sundays but every child in the school will do work on the beach cleanup and there’s two ladies that have a full time job going around with the little wheelie car emptying the rubbish from the bins. Oikos also donated some more household bins for some of the houses around the village. The bins that we donated, the big wheelie bin types because we saw that people were coming out from the local guy who sells cigars or whatever and just unwrapping the plastic and just dropping it outside on the floor outside the shop. [00:17:40.7] CM: Right, didn’t you also help distribute reading glasses as well as at some point? [00:17:46.2] CW: Yes, this was part of really the same project but what we’ve noticed was that there is a school on the island and there is a certain level of education. I think the amount of people that can actually read and write on the island would be actually surprising because we see many times with books. So yeah, we made a collection for unwanted reading glasses throughout Europe really it ended up and we took those up there for distribution amongst the islands and we made a small poster for regards, sustainable fishing methods and a kind of test to whether the glasses would work as to whether they could read this sign that was about the sustainable fishing methods. So we knew that the message had gotten through. [00:18:37.4] CW: Yeah, it went very well and many thanks to the customers and several people who are still to this day are supplying glasses but we’ve noticed that the supplies are not really drying up but certain places and certain churches and certain organizations, they’ve exhausted their supply of glasses so. [00:18:58.9] CM: Now, for anyone who actually wants to go and dive in Myanmar, it confused me, Liveaboards to Myanmar don’t depart from Myanmar, they usually depart from Thailand. Can you tell us a bit about what sites in Thailand you would typically see on route to diving in Myanmar? [00:19:15.2] CW: Yeah, it has two different routes that you can take really. 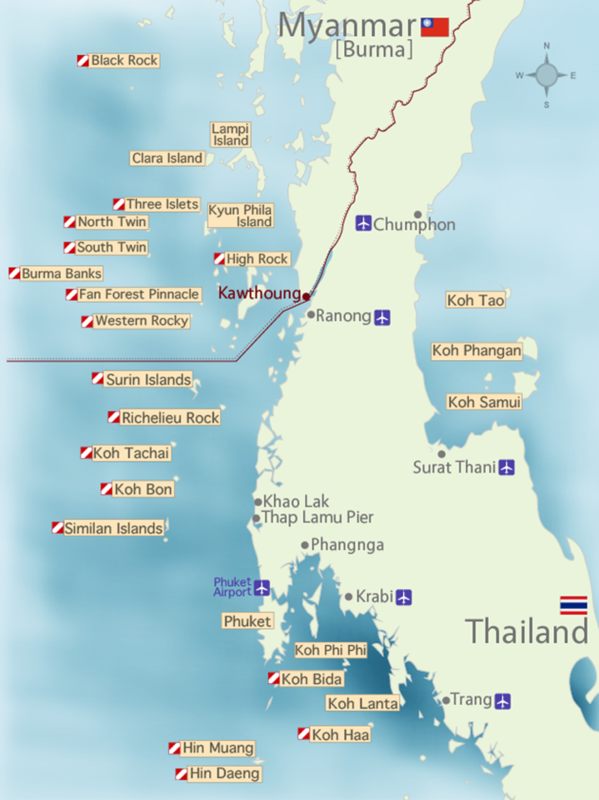 As you said, most of the diving starts in the south at a port called Tap Lamu which is a popular port for Liveaboards to leave from and on route from Tap Lamu up to the immigration in Myanmar, we have three of arguably the best dive sites in Thailand of Koh Bon, Koh Tachai and Richelieu Rock. Depending on how they’re diving and what’s been seen and weather factors and immigration factors, you can either take these three dive sites on the way up or actually on the way back is a very nice way to finish the trip. Unfortunately, we always get the comments when we come back to Thailand is, “Oh there’s another dive boat,” and that’s the deal with Burma. It’s very rare to see anybody else in Burma so once you see another few divers underwater on the way back, the reality hits home that you are back in the real world. [00:20:11.1] CM: Yeah because Koh Bon is famous for frequent manta ray sightings isn’t it? [00:20:17.4] CW: Yes, I think that’s possibly one of the top sightings that we’ve had for ID’d manta rays in Thailand as well. [00:20:25.0] CM: Right and Richelieu, well most people would say that that is the best dive site in the whole country, wouldn’t they? [00:20:32.7] CW: Yes, I believe that Richelieu was the best dive site in Thailand. [00:20:36.6] CM: Because Richelieu is also a lime stone isn’t it? So it’s almost the beginning of the archipelago. [00:20:42.1] CW: Yes, for me it is a Burma dive site. It’s exactly what we see up in Burma, submerged pinnacle in an area where there can be different currents coming from different directions and lots of nutrient in the water there. Again lots of soft coral and of course, as with any pinnacle, they are magnets for fish all seek shelter at the pinnacle. [00:21:05.8] CM: Fantastic, when the boat gets to the Myanmar border what actually happens typically? [00:21:13.2] CW: It very much depends on which boat you’re on and to the schedule as well but basically, we have to clear out of Thailand immigration wise, which is just like leaving the country likely through any airport. We need to have the customs officials and immigration officials come on board and stamp the passports and then we go into Myanmar and stamped into Myanmar and the process is just reversed on return. Recently I was up there on a private yacht and they didn’t actually come to Thailand so they just entered the straight into Myanmar and we started the trip from Myanmar. [00:22:08.5] CM: So if you wanted to do that, would you go from Yangon to the border town to, is it Khao San? [00:22:14.2] CW: Khao San yes. There is regular flights to Yangon to Khao San now and Khao San is the easiest place to access the south Mergui Archipelago at the moment. There are some other points where I hear there’s a newly formed, and I’m glad to be a part of it as well, there’s a newly formed Myanmar Divers Association and they’re a group of very committed divers who are looking into fun diving and recreational diving in the Mergui Archipelago. [00:22:50.7] CM: Right that sounds great. Okay so that’s quite a big change from the flights from Yangon because that wasn’t even available even five years ago was it? [00:23:00.1] CW: No, not at all. It’s still slightly restricted on land movement through the area but I believe that’s only due to the quality of the road. [00:23:12.5] CW: There’s a mini-bus and bus services that are taking you a little bit further north and then you can either pick up your rental car or you can do whatever and drive but I think it’s actually the quality of the road rather than the restriction of the people. [00:23:29.3] CM: Right. How would you think in snorkelling in Myanmar? Is there as many places that’s possible to do it or is it not much call? [00:23:38.5] CW: Well, I think that it will be ultimately there will be snorkelling in Myanmar because so many like putting on a set of fins and a mask and snorkel and jumping in the water and whatever they see is a bonus and of course, there’s many nice bays out there, there’s lots of sheltered areas and lots of areas where you can go snorkelling. A journalist I was up there just recently did see a grey reef shark snorkelling which was very nice. [00:24:06.8] CM: Wow, and so in terms of experience for divers going there, would you say that somewhere the newly qualified divers could go or would you say it would be better to have a few dives under your belt? You mentioned strong currents a few times earlier. [00:24:21.9] CW: Yeah, so I think there’s a few things that you would be particularly wary about if you were a novice diver, I would recommend that you were an advanced diver. A lot of the dive sites are a little bit deeper than the recreational limit for open water diver and of course, the deeper you are on a pinnacle, the less current there is. So you can hide from the current a little bit more but we meet open water divers to extremely competent in the water and they have no problems. As with the current, I don’t think it’s any stronger than anywhere else but we always see the big fish in strong current so the dive guides would take you to the area perhaps where there is a bit of current in the hopes of seeing something. But with pinnacles and these islands there are always sheltered areas. So if you’re looking for relaxing diving after a quick 10 minute fin into the current and you will always be able to find it. [00:25:21.9] CM: Right and now we talked as well earlier about high season. So that normally runs for Burma between, is it November to April? [00:25:34.5] CW: Yes, November through until the middle of April is the diving season up there. The peak months of diving up there we find are around the end of January, all of February, the middle of March, that’s when we tend to see the most of the larger critters up there, the manta rays and whale sharks. [00:25:57.8] CM: Right and a lot of boats will obviously go to Burma throughout those six months but they won’t go to Black Rock on every trip, is that right? So you have to be careful. If you want to go to Black Rock to really check that the trip you’ve chosen will be going there. [00:26:12.7] CW: Yes, absolutely. It needs to be on the schedule and I think it very much depends on budget as well. If you’re looking at a budget boat, then I would definitely check that it goes to Black Rock. There are trips that don’t include it. [00:26:26.9] CM: Okay and finally, you were talking about taking photos earlier, is there anything in particular that you really like there for photography that you think of a particularly good photographic opportunities? [00:26:38.9] CW: Well, recently on a private trip that was I on up there, I was actually employed as a land based or top side guide and I got to explore a lot more around the islands and I was lucky to be with environmentalist from Myanmar from the Yangon University and he showed me many, many different things that I actually would as a dive guide not have spotted before. So apart from the underwater life, which is incredible there, there’s also a very, very big diversity and land and bird life up there. [00:27:17.4] CM: Yes, the Eagle’s Nest is called that because there are eagles lying around it. [00:27:22.6] CW: Yes and we also find the very large hornbill as well and luckily, actually whilst moving the boat back from Black Rock, I have never seen it before or even heard of it actually, a sea owl, which apparently very rare indeed. [00:27:42.2] CW: It was following us from the boat, which was nice to see. [00:27:46.7] CM: Awesome. All right Clive, thank you very much for telling us about diving in Myanmar and I’m hoping to dive with you again soon. [00:27:55.0] CW: That’s great. Thank you so much Chris. [00:28:00.2] CM: Thanks for listening to the Dive Happy Podcast. For show notes about this episode including maps of where we’re talking about, travel tips, links to the liveaboards, resorts, books etcetera that we mentioned, and other good stuff, please visit divehappy.com/podcast.